BACKTOFRANKBLACK.COM: Believe in the Future! 10,013 Photos for a Greenlight XF3? Believe in the Future! 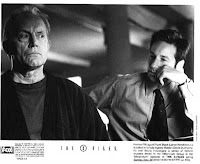 10,013 Photos for a Greenlight XF3? As you know, we're not the only campaign to making noise right now in the Carter camp and I think we can all agree we are stronger united. With this mindset, please read and consider supporting the latest drive from the X-Files News.com staff. While Back to Frank Black looks to bring Frank Black in a form of TV Event, perhaps on FX if possible, X-Files News is looking towards the big screen for The X-Files and success is a good possibility... especially with your support. Have a read and see what you think about their latest venture - could you help bring about its goal? So without further ado, please read on. I give you Tiffany Devol! A picture is worth a thousand words and this year, X-Files fans are betting that 10,013 pictures are worth a greenlight for a third X-Files feature film. The Believe in the Future campaign, headed up by XFilesNews.com since 2009, has collected thousands of postcards, videos and souvenirs for Fox from fans of the series. Fox met with XFilesNews two years ago to accept a massive delivery of fan mail from around the world. Later this year, they are prepared to do it again. The Believe in the Future campaign has the support of fans and fan groups in more than 30 countries representing 6 continents. Despite the less than stellar performance of The X-Files: I Want to Believe in 2008, many fans and critics alike have pointed out that with December 2012 looming, Fox Film has a perfect opportunity to bring back the mythology of The X-Files. The Believe in the Future campaign's 10,013 Photos for a Greenlight seeks to gather fan photos from around the world spanning the years 1993-2011 with messages to Fox explaining what The X-Files has meant to fans and why they should green light a third film. Equally exciting is the news that an X-Files event is being held at the American Film Institute in Los Angeles on May 7th. Series creator Chris Carter is expected to be there along with actor Mitch Pileggi, executive producer R.W. Goodwin, writer and director Glen Morgan, and actors Sheila Larken and Jeff Gulka. A surprise guest is also slated to make an appearance for this Q&A and book signing for the recently released LAX-Files. The X-Files is a pop culture icon with mentions in television, radio, newspaper and magazines even now, 9 years after the end of the series. With 2012 around the corner and word that a third X-Files script is in the works as of this year, fans are ready to believe in (and make) the future together. 0 Responses to "Believe in the Future! 10,013 Photos for a Greenlight XF3?" Second Sight: "The Thin White Line"